Since I happened to be in the area, and it was an absolutely gorgeous evening, I seized the opportunity to sneak off for a little weekday adventure. This place might be well known to lifelong Dunedinites, but I didn’t even know it existed until a few months ago! I’m talking about Second Beach, the other St Clair beach. Starting from the Esplanade, head towards the Salt Water Pool. 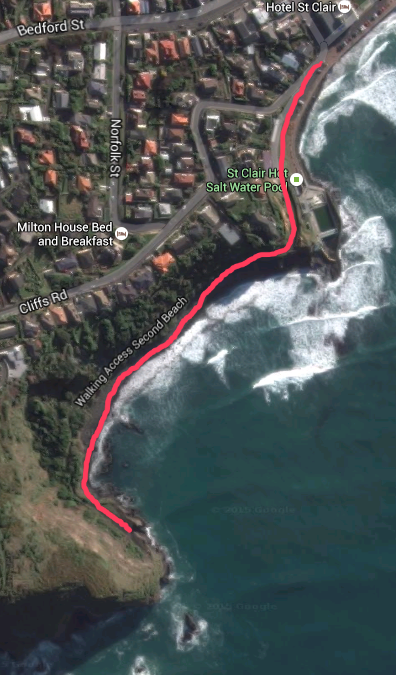 Walk up to the end of Second Beach Rd where you will find a walking access. Follow the track around the corner and – viola! Another beach! The first thing to catch my eye was a strange chimney-like cement construction. 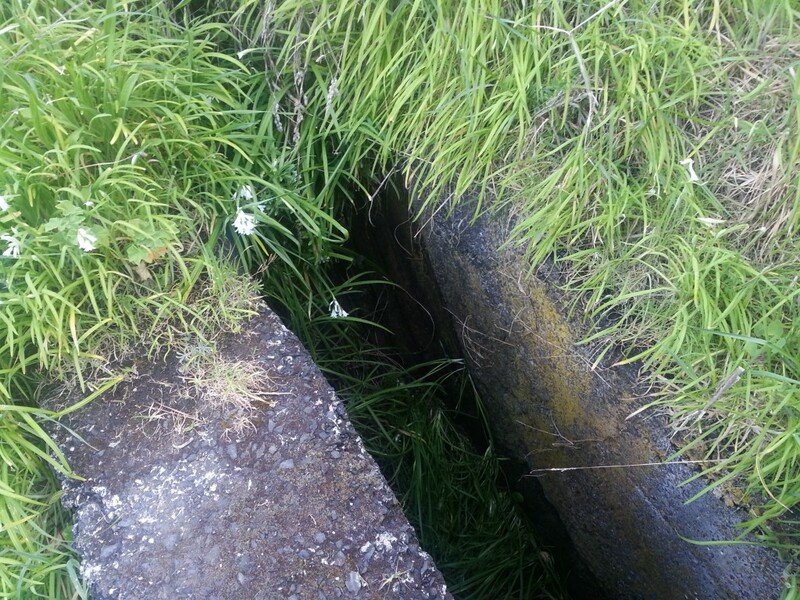 This structure is in fact a stormwater outlet, built about 1904 to prevent flooding. It ran underground from the area near Francis Hodgkin’s Retirement Village (which at the time was a quarry), under Beach and Albert Sts, finally discharging at this point. The thick conical structure of the outlet serves as a defence against the destructive surf of St Clair, which we are still grappling with today. Clearly it was a successful design, as it is still standing 111 years later! The “chimney” section has been enhanced with an artwork of a bird holding a fish. This was created by the British artist Phlegm, the same artist who painted the large Vogel Street mural. On the outcrop directly above, a gun battery once stood, built during the Russian scare of the 1880s. Look out to White Island in the distance to get an idea of its range – as the island was used for target practice. Nothing remains of the fortress now, since it was demolished in the 1950s to make way for residential development. 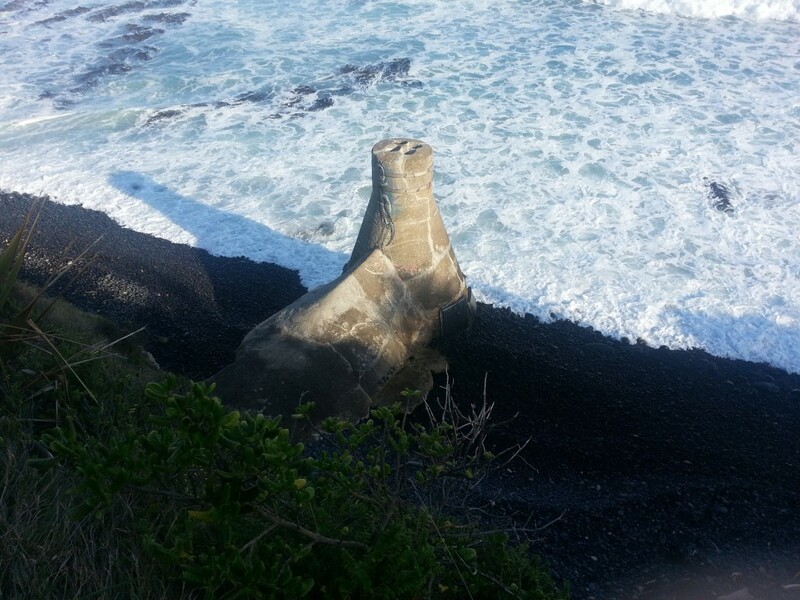 I continued down the wide flat track, admiring the surf as it crashed against the rocky boulders below. 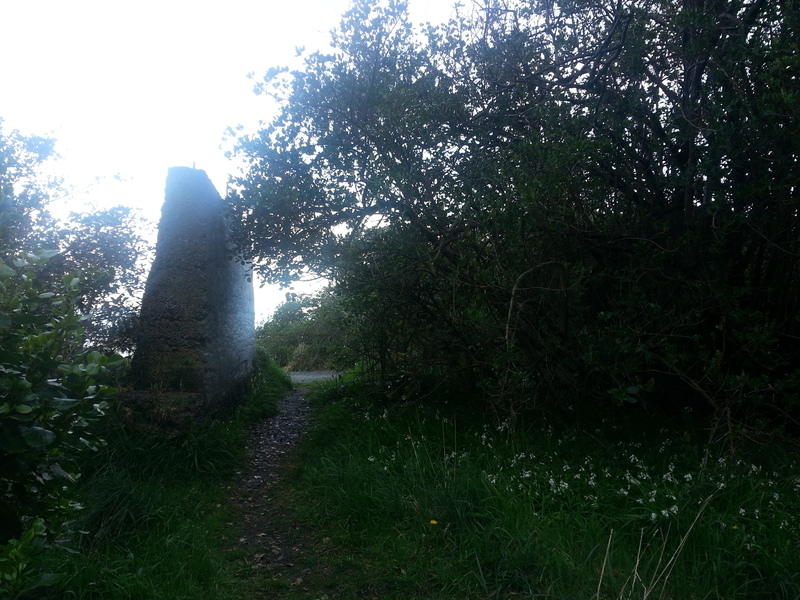 Not much further along, I came across the remains of two old concrete walls, barely visible amongst the overgrowth. 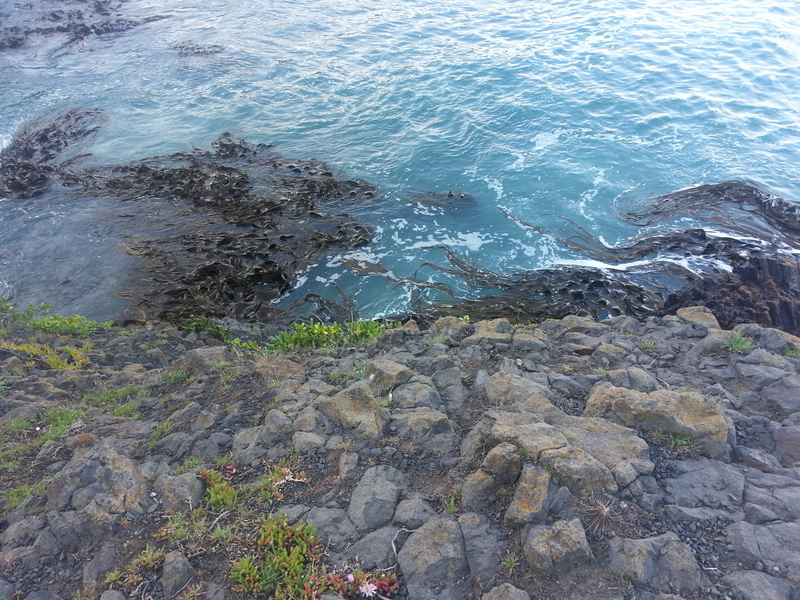 These are what remains of a basalt stone quarry that once existed here. And so far, that’s all I can tell you – if you know anything, please comment below! An overgrown relic of the quarry, perhaps a sluice? Followed by the smell of the wild onion flowers I’d trampled in my investigation, I continued towards the headland. At the far end of the track there is a wide flat area, perfect for resting and picnicking. Here too are the distinctive basalt columns that show up all around the Dunedin region, reminding us of her turbulent volcanic past. A cauldron of sorts has formed, into which the sea surges. Fun to watch…but don’t get too close! And there are blankets of kelp twisting amongst the waves. 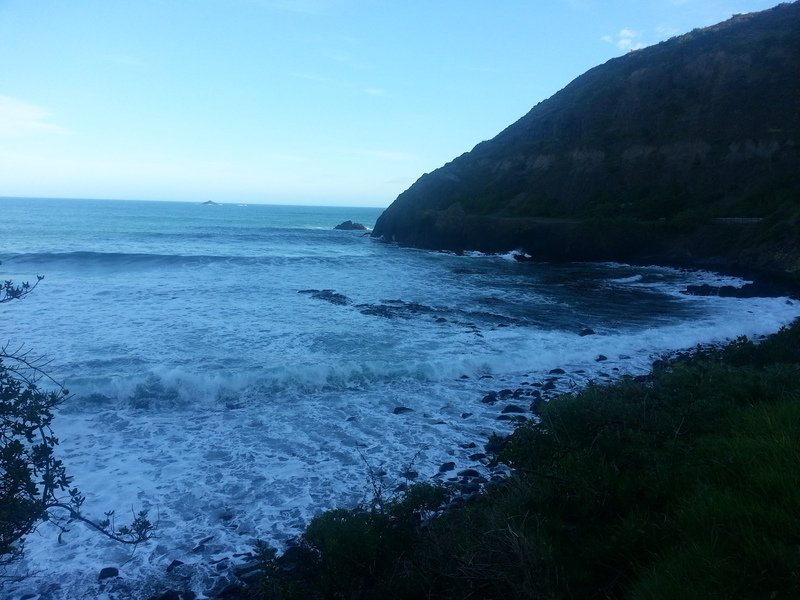 Beautiful but treacherous, they have entangled at least one good Samaritan who waded into the surf to save a drowning child. Granted, that was in 1909…and he was able to escape without injury…but let’s not let that get in the way of a good horror story! From here there is also a wonderful view along the coast towards the peninsula, in fact I think I can see the hill we walked down two weeks ago! My stomach reminded me urgently that it was dinner time, so without further dallying I hurried homewards. I too love Second Beach. I teach ESL and love taking my learners there for an easy yet invigorating walk. It’s certainly a track less travelled which makes it more appealing, in my opinion. I didn’t know what that structure was till now so thanks for researching a little bit of history. It’s a very special place for me. I grew up in Dunedin and often walked round there as I lived not far away. It has always made me think of coastal scenes in Scotland and Ireland. A daughter is on holiday in Ireland and has just posted a video of the coast on Dingle Peninsula. It’s so like Second Beach even to that sucking sound of the sea. Yes, I agree there’s a sense of mystery and treachery pervading it. It’s magic. I wish Second Beach had a Maori name. That’s why I discovered your site. I was looking to see if it had one. It is a very unique place!